There is a mantra for everything – for every ill and every challenge. There are as many reasons to chant as there are stars in the sky. Among the many benefits of chanting mantras are an increase in self-esteem and intuition, relief from anxiety and stress, and a boost in physical health. But don’t take our word for it – chant mantra for yourself and experience the healing power of sound! 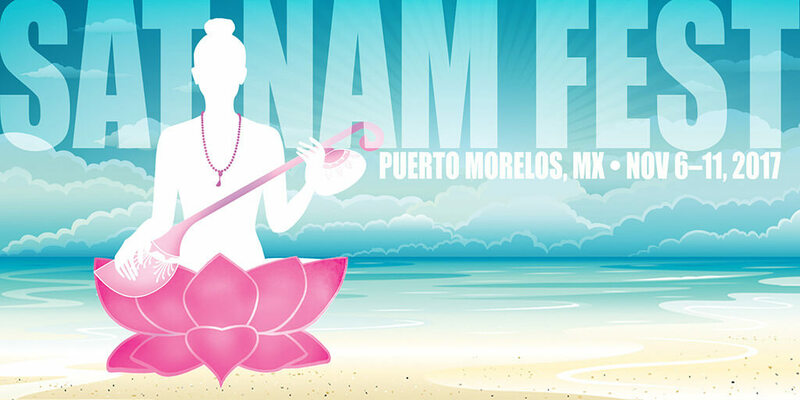 If sacred chant music inspires you, join hundreds of yogis in Puerto Morelos, México this November 6-11, 2017 for Sat Nam Fest and an opportunity to chant with world – renowned mantra artists! Meditation channels the flow of energy through the mind-body circuit, adjusting the chemical composition of our internal states and regulating brain-hemisphere imbalances, contributing to a natural abatement of fear and despair–emotions that underlie both of these common afflictions. By balancing the nervous system, chanting regulates the chronic stress and tension that is the norm for many people in today’s hyper-stimulated lifestyle. And by balancing the endocrine system, chanting normalizes hormone production, which balances our moods and overall sense of well-being. 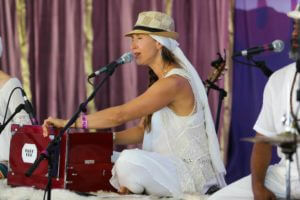 Chanting delivers us from the excessive preoccupation with our bodies and with material concerns. It delivers us from fear of old age and death. We begin to identify with the timelessness of the soul and consequently begin to shed neurotic habits that no longer serve and that no longer seem relevant. By returning us to what is essential, it clears away subconscious habit patterns. Embraced by the steady rhythm and by the vibration that connects us all, our thoughts combine wholly with the sound current. As the captain sets the canvas to the wind, thus pulling the boat out of trouble, it is through mantra that we steer ourselves out of our own stormy seas and into clear waters. The power of mantra is betrayed in the roots of the sanskrit word, man, meaning mind, and, tra, meaning deliverance, or, projection. Thus, chanting the sacred sound of the mantra delivers us from our sense dependency, from our unrelenting habit of looking toward the senses for gratification; pleasures that are and that will always be, fleeting and limited–how much can you eat? Or drink? Or buy? Sense gratification never really gratifies. We are always left either unfulfilled and guilty–wishing we had never started, or else, wanting more and lamenting the loss. While the first stages of mantra meditation deliver our restless minds from their self-inflicted distress, eventually, chanting into the all-engulfing wave of vibrations arouses our experience of ourselves as spiritual beings. It opens our perception of ourselves as undifferentiated from God. It awakens the divine light and love within us. As George Harrison has said of his lifelong Bhakti practice, chanting is “a direct connection with God.” When our spiritual identity is awakened, we experience the unity of all life, which consequently awakens our hearts and opens our capacity for compassion, whereupon we may live out our material lives free of animosity, envy and pride. It’s all about the hypothalamus. The control tower of the brain, it regulates communication between the nervous system and the endocrine system, taking in information from the entire body, before transmitting outward again, via chemical messengers. These couriers, such as serotonin and dopamine, are known as the “happiness hormones,” due to the impact they have on our moods. The hypothalamus is Office in Charge of many bodily functions we tend to think of as automatic, like temperature, metabolism and nervous system, as well as pituitary secretion, affecting everything from mood to appetite to sleep. It is perhaps the single most important link in the mind-body connection. What common western manuals won’t tell you, is that it is the breath that turns the key to this super-circuit, this central hub, this brain of brains. Breath helps to adjust all the rhythms of our body–not only the familiar circadian rhythms, but the lesser known ultradian rhythms, which monitor the smaller-scale energy cycles that occur throughout the day. Because our nervous systems are often overtaxed, these rhythms are thrown out of balance. But through the technology of sound, we begin repairs. 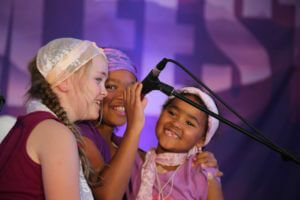 And when breath is set to sound–Wowee Zonkers! The positive effects on the parasympathetic nervous system – that part of the nervous system that tells us everything is alright – are multiplied and the healing response is triggered and it all translates into healing and stronger immunity. You don’t have to sing well because it’s not about singing, in the usual sense. We’re not memorizing complex lyrics, layering harmonies, and we’re not certainly not busting out powerhouse solos. 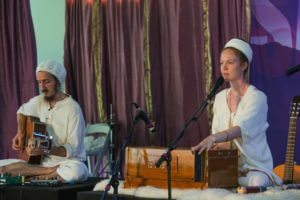 It works whether it’s done alone, or in a group, as in a powerful kirtan. It works whether it’s done softly or in full voice, as long it is from the heart and with the belly. Although for enhanced effect, we can add eye-focus and a gentle hand mudra, these are simple to include and can be incorporated gradually. All you have to do is show up. As Krishna Das has said, it won’t work if you don’t do it! All that is needed is some time and an open heart. The benefits of chanting cannot be established through reasoning and intellect. It can only be experienced through devotion, faith and constant repetition of the Mantra. Pronunciation: By enunciating the mantra, the tongue taps certain points along the roof of our mouths, sending signals to the hypothalamus, which in turn, regulates the chemical activity streaming into all parts of the brain and body. It might be likened to tapping the keys of a piano–inside the casing, a hammer bounces up and strikes the strings which are tuned to produce a specific and foreseeable note; behind the curtains a remarkable vibratory process is going on. Rhythm: Through repetition of the mantra, patterns of sound are inscribed onto the brain. The unconscious becomes the conscious, the automatic becomes the deliberate, the mindless becomes the heartfelt. The repetition frees us from our destination-fixation–from our need to rush to the end. The repetition is the whole point. Through repetition, the mantra washes over us, as the waves in the sea gradually get us wet. It dissolves us into unison, which is the essence of yoga. We “die” in a sense, as our ego fades into the infinite, as it gets unavoidably absorbed by the sound. Our thoughts reflect and affect our mood, our attitude and our general tenor. Our thoughts are silent sounds. And sounds are electromagnetic vibrations. The more refined our thoughts, the more elevated our vibration; the more elevated our vibration, the closer we get to the highest vibration of all–our own divine nature. The entire universe was built on sound, which is nothing but vibration. By vibrating a certain combination of sounds, we are able to tune into various levels of intelligence, or consciousness. Thus, chanting mantras is a conscious method of controlling our moods, and in turn, our frequency and resultant all-around radiance, much like changing the channel on the television. In the Hindu and related Dharmic traditions that use mantra meditation as a regular part of practice, you will find there is a mantra for everything–for every ill and every challenge. To note just a few examples, in the Tibetan tradition, the Om Mane Padme Hum mantra has been used for centuries to invoke the blessings of compassion. In the Hindu tradition, the Ganesh mantra–Om Gam Ganapataye Namah–is chanted to the elephant-headed deity to remove obstacles. 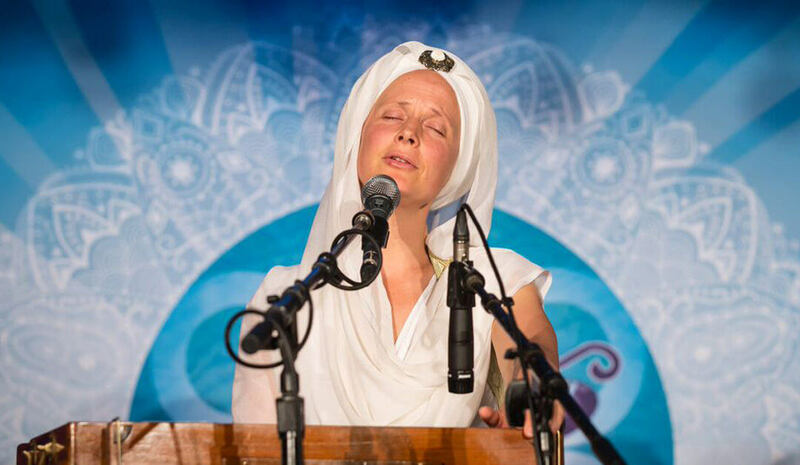 And, in the Kundalini Yoga tradition, the Siri Gaitri Mantra–Ra Ma Da Sa–is chanted for healing. Wonderful article. Rather difficult to learn chanting from a book, nor can everyone get to a place. My first learning experience was, as a 70+ yr old adult, Snatam Kauer’s DVD Kundalini Yoga for children. This incredible DVD was great for me,an adult, and set me on the path of chanting and yearning for more knowledge.